In September 2016, the Duchess of Cambridge (still often referred to as Kate Middleton) visited Vancouver in Canada. She carried a beautiful red suede bag by Miu Miu. The bow-embellished bag coordinated with the Duchess’s outfit beautifully. The bag was made in Italy from plush crimson coloured suede and finished with a bow. A little gold Miu Miu label adorns the front of the bow detailing too. The bag can be carried as a clutch, or it can be worn as a shoulder bag using the attached gilded silver chain strap. It retailed for £640 GBP / $895 USD. The bag has a mirror on the inside and three large compartments for storing essentials. Net-A-Porter describes the bag as “ladylike” in style. 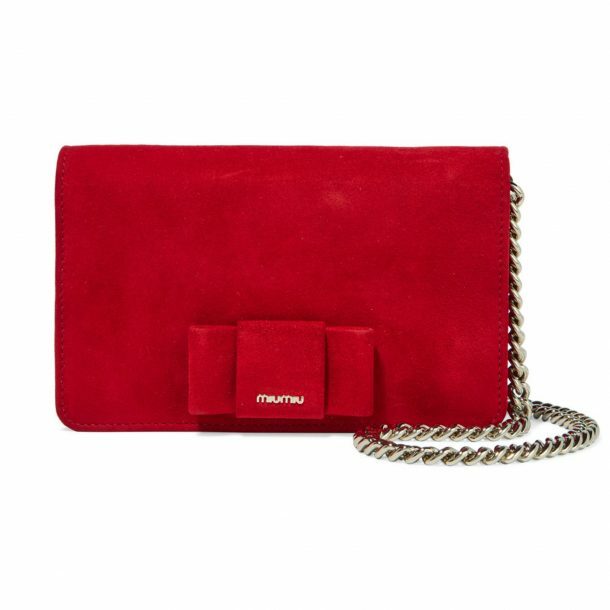 Sadly, the red suede version of the bag has now sold out. However, it is still available in black. The chic bow bag also comes in a number of other colours: The company offers express delivery and free returns worldwide (to the best of my knowledge). 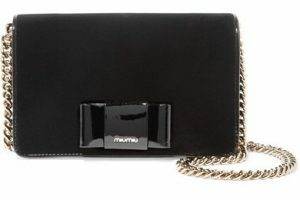 Net-A-Porter.com stocks the bag in black for £640 GBP / $895 USD. They offer free three-day delivery in the United States and free standard delivery in the UK. They also ship to a number of other countries around the world. MyTheresa.com sells the bag in a dark blue colour for £640 and it qualifies for free shipping. The cost for delivery to the United States is $ 1,010, but this includes duties and handling. ( The company ships to a number of different countries if you’re from elsewhere). The Duchess has never worn any Miu Miu clothing or carried their bags in public, to my knowledge. All information correct at the time of last update (September 1st, 2017). Please be aware that prices, delivery options and offers can change at any time.